Welcome to Agave Grove ~ Enjoy this recently remodeled 2 bedroom condo set in the heart of the valley. You will be within minutes of so many area attractions ~ Phoenix Zoo (1.3 mi. ), ASU main campus (3.5 mi. ), Old Town Scottsdale (4.8 mi.). Coming to town for Spring Training? There are 3 Spring Training stadiums all within 6 miles of here, Sloan Park, Tempe Diablo Stadium, Scottsdale Stadium. This exclusive gated community offers top notch amenities and grounds. Enjoy 2 community pools. The largest of the two is a heated salt water pool located at the front of the community. The second is just a few steps away from the condo towards the back of the community. The large fitness center features plenty of cardio equipment, free weights, and universal machines to suit you even on a busy day. Upon entering the condo you will quickly take notice to the care and attention to details that the owners took when creating this space. Each bedroom has quality linens atop beds you will sink into. The master bedroom has a mounted flat screen TV, dresser drawers and a walk-in closet. While the guest room does not have a closet there is plenty of storage in the 3 drawer chest and hooks on the wall for use. The sunset views from every window and balcony off the living room will give you a nightly show of purples, blues and pinks as the sun retreats behind the horizon. The leather sectional sofa, entertainment center, flat screen TV create a relaxing space to enjoy alone or with a few friends. There are board games availble to entertain each other and books for everyones enjoyment. The updated and upgraded kitchen will surely provide a space to create your daily meals or at least provide a pretty space to look at. It is fully stocked with basic necessaties to cook and bake during your stay. *community club house and fitness center is under renovation set to be complete May 2019. ** 6 to 7 Month Summer Lease Special: May through October / November. $1950.00 a month 2.3%+ tax. 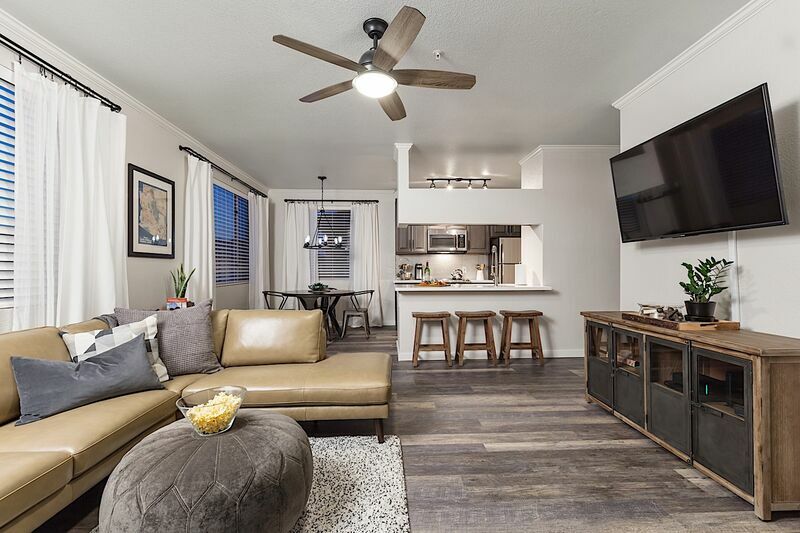 Includes: Electric up to $150.00 per month, W/S/G/, HOA, Cable Tv, WiFi internet when you lease for 6 months! . $225.00 move-out cleaning fee, one month's rent refundable security deposit.